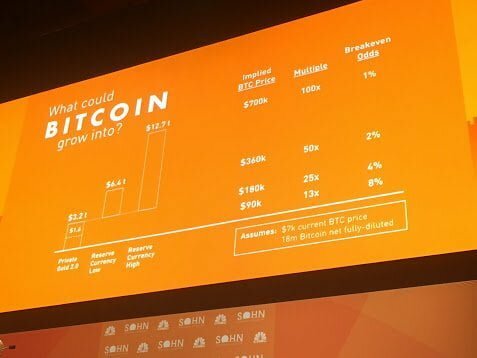 John Pfeffer detailed notes from the 2018 Sohn Conference, discussing the value of Bitcoin. Framing investing as betting makes it seem real and puts the mind in thinking of probabilities and outcomes. Today two basis points: 1) most mutual assets today currently bad bets and 2) why bitcoin is good bet despite the substantial risk. This technology is real and significant potential. The big break through came when called Yakimoto built something to solve cryptocurrency question on how do you prevent it to be spent twice without relying on authority. His solution was to have independent parties, called miners, to come to the consensus every two minutes, on which were transactions were valid. It made it very expensive to cheat and it kept ledger secure. Suddenly, digital lines to secure was possible and bitcoin was born. Just as we had data, now we have the key ingredient of independent value. Suddenly number of crypto assets have exploded. Original invention in the form of utility protocol. Where bitcoin to stood out to me, utility protocols are trying to be smart contract platforms like eutherium or EOS – decentralized applications (DAP) trying to decentralize industries ranging from insurance to betting to social media. Right now, pretty much all crypto assets are either trying to be money or utility assets as utility protocols. Now in the very near future, we’re going to start seeing claims on cash flows look like debt and equity royalty streams. We’re going to see nonfungible token digital activity. I am going to focus right now in money and utility protocols. Blockchain protocols have several things in commen: 1) open source software projects. Pretty much any line of code can be copied by anyone. Protocols could be port to create competing versions of the same software. The friction is converting one protocol from one crypto assets to another one is low. Finally, unprofitability is going to be very high across protocols. Unlike the security which we can value by discounting expected cash flows, you can’t do that with crypto. Whether you are trying to raise money or utility protocol, these kind of crypto assets have equation of exchange. In economy, you have the money supply has to equal the economic activity (avg price per transaction x number of transactions / velocity of which currency changes hands). This equation allows us to think about how what the drivers are of the value of crypto currency and how they relate. In terms in crypto, the more econ activity denominated in that currency, the higher the net worth value of the currency. However, higher velocity will lower the net worth. For bets, we look at potential outcomes, probabilities and do best we can to assign probabilities. A rational bet is where there is a positive expected value and size is appropriate for the risk. Even if bet is high risk can make sense if potential payoff is high enough and size is appropriate. Valuations suggest investors consider crypto assets to be substitutes and nothing could be further from the truth. They are all trying to become different things and have profound implications of what they can do in the future. There is one way out of this value trap. If people wanted to store wealth in crypto asset. The best technology to track ledgers is gold. We can find another technology to perform this function. Its not if, its how and when. We can probably settle on just one. Bitcoin is the first viable candidate to replace gold the world has seen. Most [other] cryptoassets out there are bad bets. Bitcoin is better than gold on every front. Bitcoin’s very DNA is focused on readability and decentralization. Also, functioning flawlessly, infrastructure, highest network value and least likely to breach security. Thinking back to exchange equation, if people use something to store value, it means they are going to hold on it, so lower velocity so could be worth a lot. So what can bitcoin be worth if it becomes a monetary storage like gold. Let’s go through scenarios. If bitcoin were to displace private gold buillion, $1.6 trillion is private held buillion. As bitcoin easier to store and transact, lets say bitcoin 1 – 2x buillion cubes, which would bring network value between $1.6-$3.2 trillion compared to the $150bn today. A second step would be for bitcoin to make inroads into the global reserve currency. Total foreign reserves are $12.7trillion, 11% is gold and rest is fiat dollars. Sovereigns want to put some of wealth in fiat currencies of their main trading partners. Bitcoin can displace some foreign reserves over time. Say displace 25% low end and 75% high end, that would add $10.2 to $8.5Tr in networth value, so totaling net worth value of $6.4 – $12.7 trillion for bitcoin. This wouldn’t happen today but over time. If one small nation would put bitcoin in reserve, it could cause domino effect. No doubt, betting on bitcoin is risky. But the scenarios above illustrate what could happen. Purely as digital gold, we could get to bitcoin value of $90,000 to $180,000. This is a 13.5x multiple. Bitcoin has positive expected value if you assign it an 8% probability of passing relatively low bar of equaling gold buillions. That 8% actually seems reasonable. In summary, am I saying bitcoin is only going to survive, not at all. I think there will be hyper specialized, massively moving protocol that is frictionless. Think digital fiat will be dying. We may have large asset classes of tokenized securities cash flows. On the utility token front, probably 70-80 smart contract platforms. What is unclear is how any success of adoption of any of the utility protocols is going to translate to investor value. Bitcoin may become a multi trillion monetary storage value. Despite the risk, the upside is sufficient to make a small, long-term VC buy and hold unlevered bet makes sense.